It’s the spirit of entrepreneurs and small business leaders that built and founded our country. While the days of yore may have been exclusive to a certain type of person, today the playing field is truly level and equality is at it’s truest form with entrepreneurship. Anyone can be an entrepreneur. When you look at the diversity of entrepreneurs it remains one of the greatest opportunities of today’s world. Small businesses, too, have a huge impact on the economy and make up a thriving and vital part of our country’s business. The efforts, passion and risks that these individuals take is being brought to the forefront with efforts like National Small Business Week, celebrated over the span of one week each year in May to honor these hard working business owners. 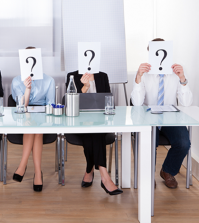 Did you know that over fifty percent of the U.S. either own or work for a small business? It’s true. The Small Business Association has been instrumental in helping Small Business Week come to life and it had been formally honored since 1963! So why don’t we also have a National Entrepreneurs' Day celebrating the spirit and community who are also dedicated to innovation and leading change in the U.S.? Long time entrepreneurs and co-founders of the Grasshopper Group (dubbed “the entrepreneur’s phone system”) Siamak Taghaddos and David Hauser have been on a mission to make the day official for years. Since 2010, thanks to Siamak and David’s diligent efforts, they’ve been able to have National Entrepreneurs' Day celebrated in November, as a Presidential Proclamation with the support of President Barack Obama. However, it’s time to take this movement from proclamation to established holiday and honor the entrepreneurs who are changing the country and the world! Siamek and David are long time entrepreneurs who know that this day dedicated to entrepreneurs is long overdue. After the financial crash of 2008 and the subsequent bailouts that started to happen in the aftermath, these Grasshopper Group co-founders realized that entrepreneurs were the true bailout for the U.S. economy, not the government or big business. They started the rallying cry with this epically inspiring video: Entrepreneurs Can Change the World. They’ve garnered a whole coalition of other entrepreneurs, like myself and my brother, Matthew, Peter Shankman, Matt Wullenweg and so many more, as well as a fine group of politicians who are standing in support of getting National Entrepreneurs' Day passed into formalized holiday status. If you’re ready to add your support behind the cause, visit this website and start the less than five minute process of telling Congress you support National Entrepreneurs' Day now. If you’re wondering just what makes entrepreneurship so great, here is a list of the top 10 reasons why entrepreneurship is so important and why you need to lend your support to make an established National Entrepreneurs' Day. 1. America was founded by entrepreneurs. The word entrepreneur means a person who organizes and operates a business or businesses, taking on greater than normal financial risks in order to do so. Think of America’s forefathers like the enterprising Benjamin Franklin, printing press magnate and innovator of understanding electricity with his risky kite in a field stunt. Or Betsy Ross, maybe not a forefather but the creator and designer of the first American Flag, and according to legend, productivity management with her changing of the commonly used six point star to the five-point stars on the new flag (easier to make and faster). There were a whole slew of lesser known doctors, lawyers and enterprising men behind our country’s Declaration of Independence. We’re a country of entrepreneurs and for that reason alone, National Entrepreneurs' Day makes as much sense as a President’s Day holiday, maybe more! This year’s billionaires had an average net worth of $4.7 billion. And the total net worth of this year's list was $6.4 trillion, up from $5.4 trillion last year. 3. The top five wealthiest people in America are all entrepreneurs and they helm large companies staffing huge populations of Americans, all with companies they founded themselves. According to the Forbes 2014 list of wealthiest Americans, Bill Gates (Macintosh), Warren Buffet (Berkshire Hathaway), Larry Ellison (Oracle), the Koch brothers (Koch Industries) and the Walton Family (Wal-Mart) are all self-made or part of the family’s self-made business. Whether you’re for or against the type of business these billionaire companies represent, there’s no arguing that’s a tremendous amount of capital and jobs for the U.S. economy. 4. A national holiday will help bring recognition and spark conversations about entrepreneurism with children: they’re the future entrepreneurs! Some say it’s never too late but Matthew and I say it’s never too early! We started the Kidpreneurs movement to encourage teachers and parents to get young ones involved with the entrepreneurship way of life early! There are lots of ways to get involved and learn more. Start by visiting the Kidpreneurs website, get a copy of the book, Kidpreneurs: Young Entrepeneurs With Big Ideas and the companion Teacher/Parent Guide. Check out this great video on just how important instilling entrepreneurship in kids is to our collective future, then join us as we encourage entrepreneurship in kids and support National Entrepreneurs' Day. 5. Entrepreneurs are the best suited to meet the changes in our economy and global world. Part of entrepreneurship is taking risks, innovating solutions to problems and transforming setbacks into opportunities. The entrepreneurs of our country are the ones who will be able to adapt to changes in our economy, design and provide answers to new problems that face us all and will be willing to take the financial and personal risks necessary to create real change. It’s not an easy lifestyle, but it’s a rewarding one. Support these entrepreneurs and show them they’re challenges are worth our recognition by supporting a National Entrepreneur Day. 7. Entrepreneurship has the power to change the world. Seriously. Did you know the wealthiest person in the world is Bill Gates? He’s been listed as the wealthiest billionaire in the world for fifteen of the last twenty years and in 2014 he was back at number one on that list. All thanks to a computer start-up that would become Macintosh and was influential in the mass popularity of the affordable and accessible personal computer. Think of all the changes the last twenty years have ushered in thanks to the personal computer and Macintosh. Think of all the offshoots that have created even further innovation from Macintosh and their Windows platform. There’s definitely something to be said for the entrepreneur and their innovating minds. Don’t they deserve a day to be recognized? 8. Entrepreneurs make life better for everyone. Not only do they change the way that people do things, they make everyone’s life better. Love your iPhone? Thank entrepreneur Steve Jobs for Apple. Enjoy how easily you can access your files from your phone or any computer? Look up Drew Houston and thank him for Dropbox. Big fan of using Uber? Thank Garrett Camp. These entrepreneurs aren’t just coming up with solutions; they’re making life easier for everyone. They’re leveling playing fields, lowering barrier entries to business and just all around making life awesome. Let’s show our support with a National Entrepreneur Day! 9. Know how had the biggest net gain in income in 2014? The entrepreneurs. Who exactly? Facebook's Mark Zuckerberg, who more than doubled his fortune to $28.5 billion as Facebook stock soared. But in the spirit of entrepreneurship, one person being better off means lots of people are better off. In addition to all the people and businesses worldwide who use social media outlet Facebook to stay in touch and communicate, there were three newcomers to the billionaire list thanks to the halo effect of Facebook: Facebook's Chief Operating Officer Sheryl Sandberg and WhatsApp founders Jan Koum and Brian Acton, who recently sold their business to Facebook for $19 billion. Entrepreneurship creates opportunities for everyone. 10. Entrepreneurship is the greatest source of opportunity for everyone. Sure, there are lots of billionaires entrepreneurs, but the truth is, that even if you’re not a billionaire, entrepreneurship is the opportunity that everyone can access in America. It’s available to everyone to live, regardless of age, gender, color or any other unfairly limiting factor. All you need is a bright idea and your own belief in yourself. Entrepreneurship is the spirit of equal opportunity and innovation for anyone who is willing to do the work and take the risks. It’s the spirit of America and the essence of how and why our country was founded. Entrepreneurship just might be the most quintessentially American principle around. Even our favorite ideal, “the American dream” is based on the idea of entrepreneurship. Doesn’t that dream deserve a day of recognition? 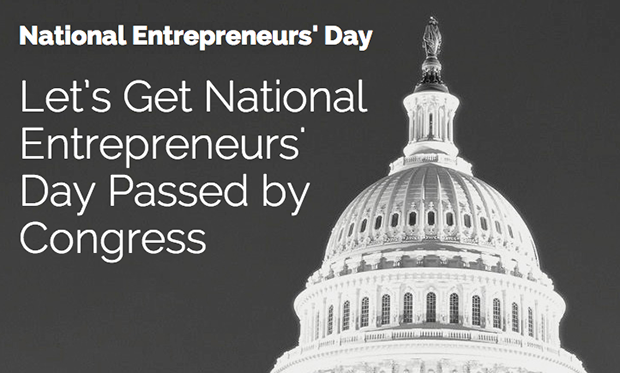 Join with the other entrepreneurs, small business leaders and concerned citizens who are putting their vote behind House Resolution 401 to make National Entrepeneurs Day official! It takes less than five minutes to sign the petition and let the government know we have your support. Then help us spread the word to reach our goal of 50,000 votes by sharing the message with your friends, fans and followers on Twitter and Instagram.